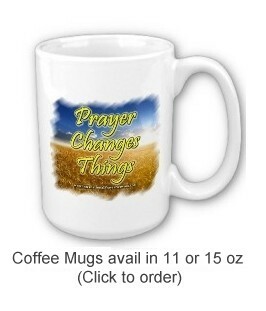 You already know that "Prayer Changes Things," but how about your friends, family or coworkers? These attractive products are a great way to share your faith in God, and to offer a gentle reminder of the hope and encouragement that is available through prayer. These also give you an opportunity to express your enthusiasm for the ministry of the International Prayer Network, by displaying the included web address of the IPN imprinted on each. Click on each item image to order from Zazzle.com®. The coffee mug has a large handle that's easy to hold and comes in 11oz and 15oz sizes. Dishwasher and microwave safe. Makes a great gift! The 3" x 11" bumper sticker is attractive and will outlast heavy rain, intense sunlight, and the most severe of traffic jams. This good looking ball cap is cool nylon mesh with 100% polyester foam front. Adjustable from 17" to 24". Available in 11 color combinations. 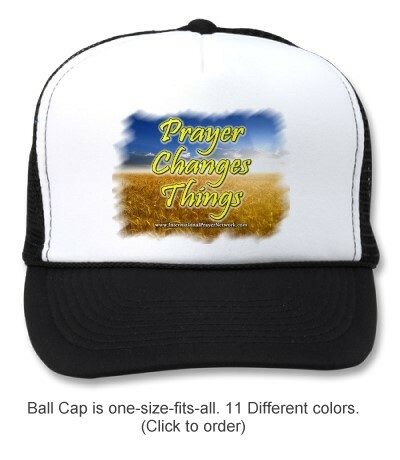 These and other products are sold by Zazzle.com® and are made available primarily as witnessing tools and to promote the ministry of the International Prayer Network. The IPN earns a small commission (10%) of each sale which goes toward the expenses of this ministry.